These are all the events going on in Corpus Christi the month of December! We've got the scoop Santa, holiday celebrations, Christmas fun, live nativities, and more. There are many regular annual events that haven't posted their information yet, so make sure to check back often because this site will be updated regularly. Always check with the organization for the most updated information since information is subject to change. All events in Corpus Christi unless indicated. Don't worry, we will remind you about these events as well! If your organization has something going on and would like to be included, send us an email. 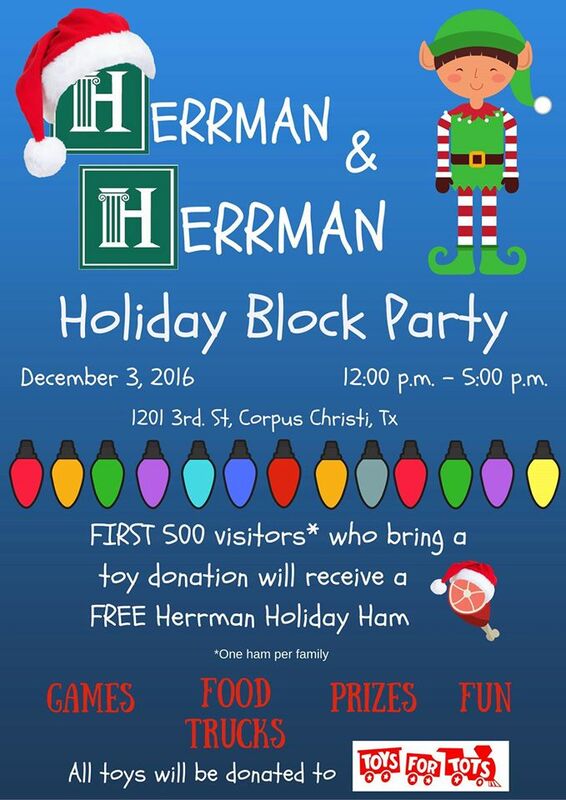 Also, compiling these lists is a lot of work, so please by courteous and give credit to Corpus Christi Fun for Kids when using this info. 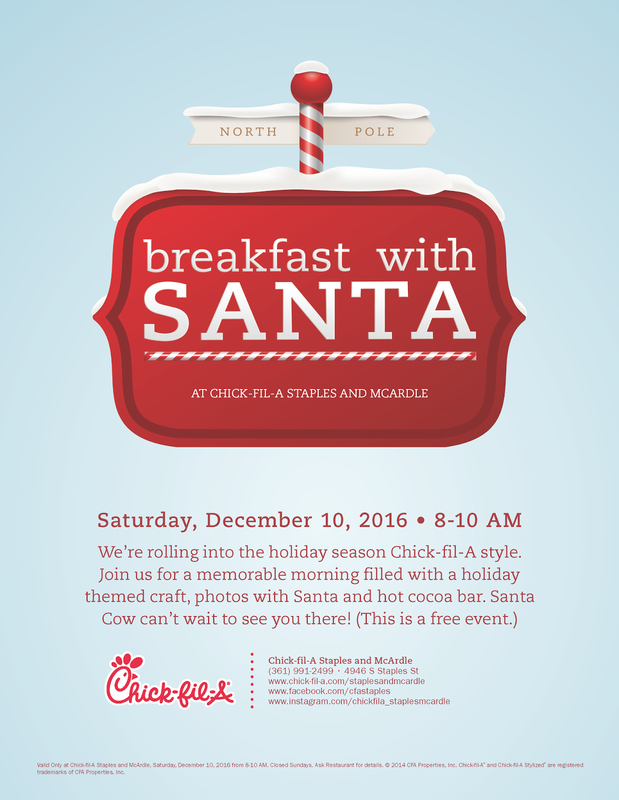 Looking for just breakfast with Santa? Click here! 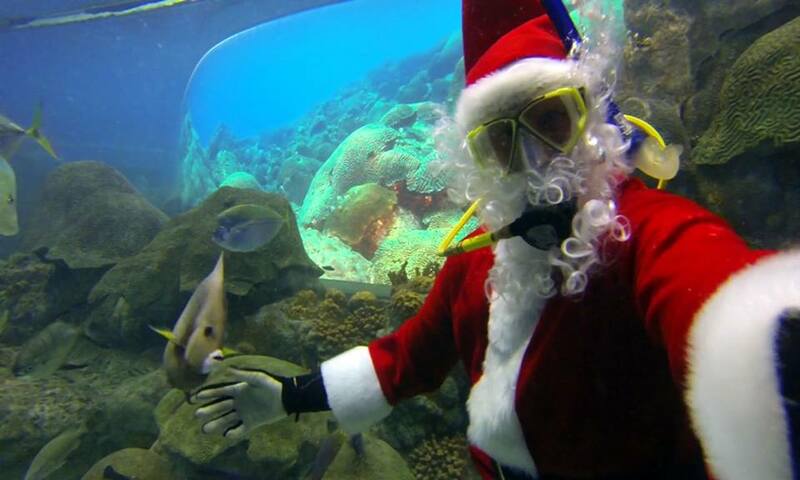 You can catch Scuba Santa when you visit the Aquarium’s “Diver in the Water” presentation at the Flower Gardens exhibit. Scuba Santa will make daily appearances at 10 am. Enjoy entertainment, refreshments, and specials at participating businesses. The atmosphere will be filled to the brim with holiday cheer! New this year is a food court made available to guests consisting of booths set up by participating restaurants. This is in addition to the restaurants in the centers dine in option. Also prize packs for the kiddos and special drawings for kids under 18 and broken up by age groups. Meet and greet with Olaf, Penguins of Madagascar and the Minions. 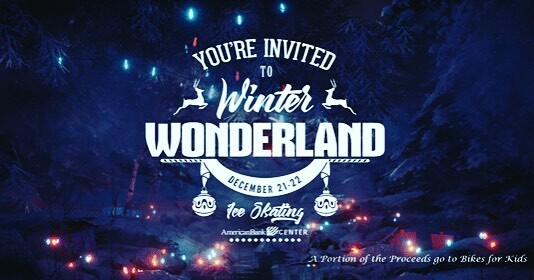 Come with the whole family and enjoy a snow party, games, refreshments. Bring an unwrapped toy for the Marin Corps’ Toys for Tots drive. 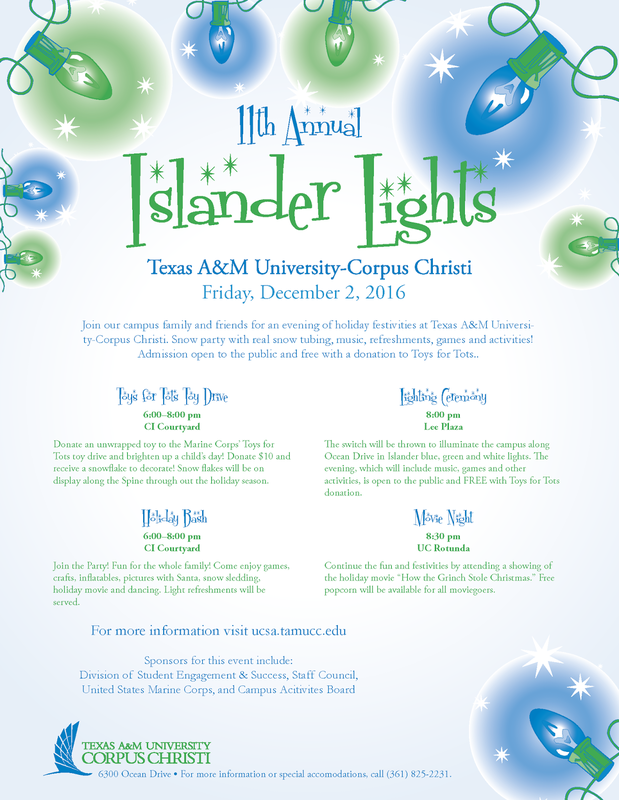 At 8 pm, the switch will be thrown to illuminate the campus in Islander blue, green and white lights. 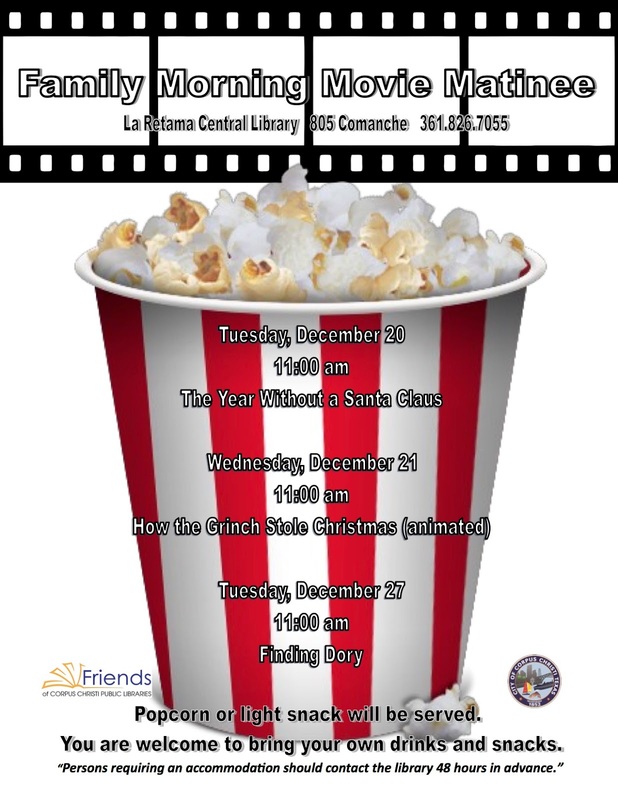 To finish the evening, a movie “will be shown in the University Center Rotunda at 8:30 pm. High Balloons with bounce houses and car train ride. Free hot chocolate and cookies. Pictures with Santa Claus and the park will be decorated with Christmas lights. 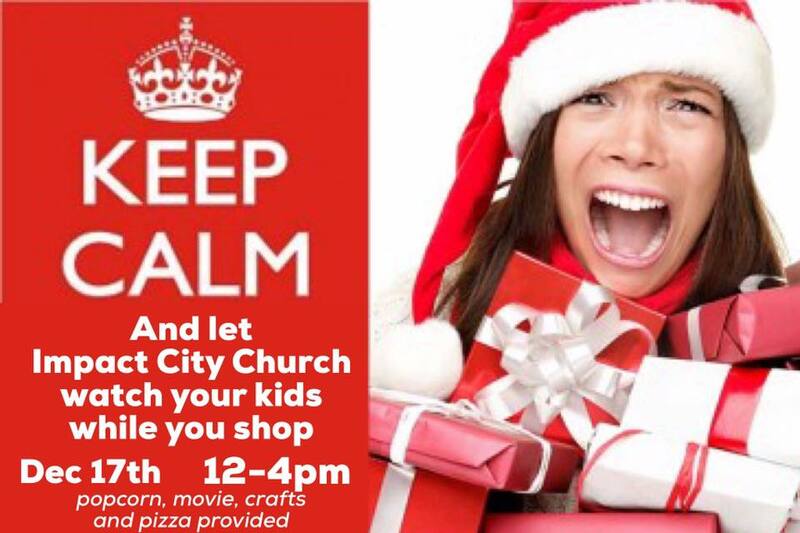 Free face painting and crafts for the kids. Plus the Grinch and a few other Christmas characters walking around. Annual illuminated Christmas parade. 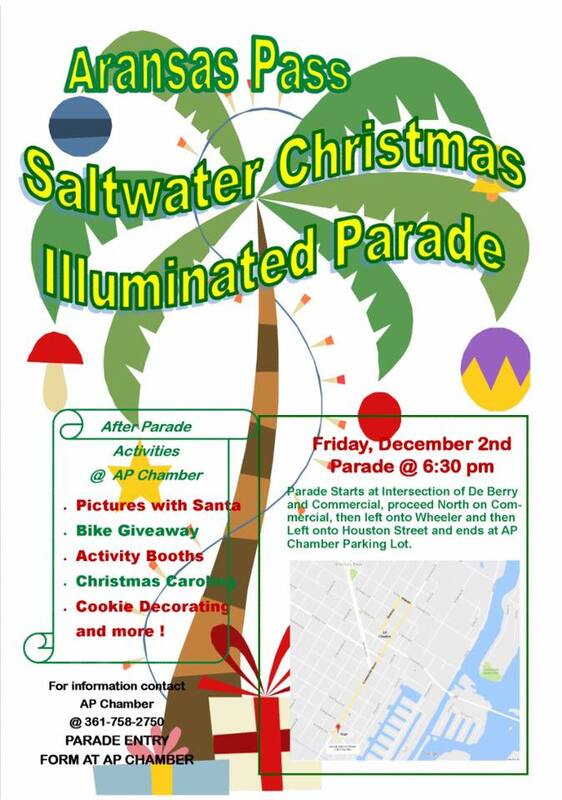 Stay after the parade at the Chamber of Commerce parking lot for activities at AP Chamber Parking Lot for pictures with Santa, bike giveaway, activity booths, Christmas caroling and cookie decorating. Parade Starts at Intersection of De Berry and Commercial, proceed North on Commercial, then left onto Wheeler and then Left onto Houston Street and ends at AP Chamber Parking Lot. All aboard! 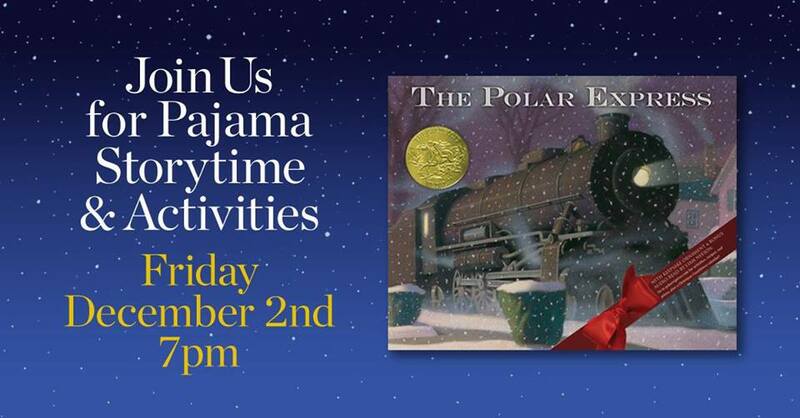 Come in your PJs and join us for a magical evening as we host our annual Polar Express Storytime. Coloring and activities to follow, including writing a Dear Santa letter! 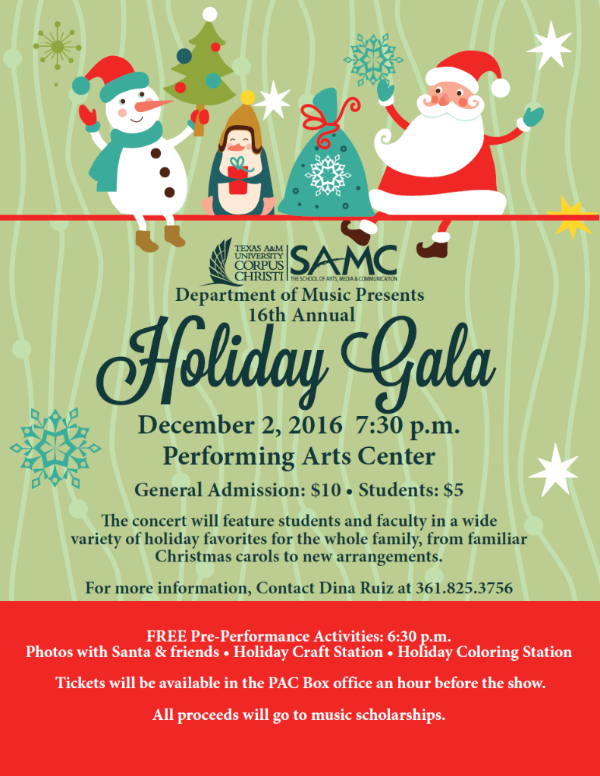 The concert features students and faculty in a wide variety of holiday favorites for the whole family, from familiar Christmas carols to new arrangements. 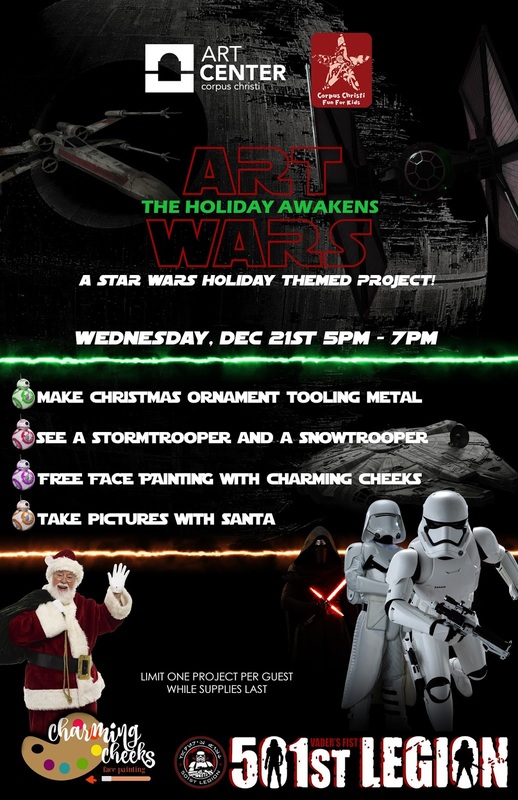 Pre-performance activities, including a holiday coloring station, craft station and special appearance by Mrs. And Mrs. Clause, Frosty, Snowman and Elves, start at 6:30 p.m. in the PAC lobby. Cost: Prices are $10 for adults and $5 for students. Tickets are available in the PAC lobby one hour before show time. 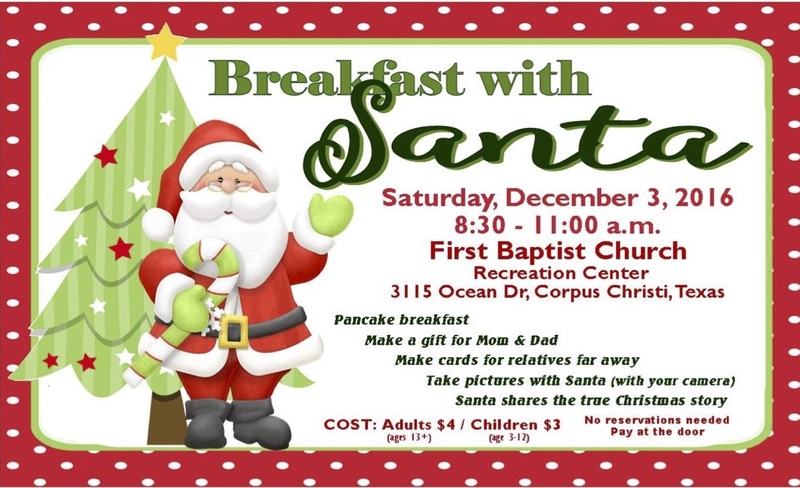 Pancake breakfast, crafts, free picture with Santa. Cost: $4 per adult and $3 for child, children 2 and under free. Parents, teachers, and children! 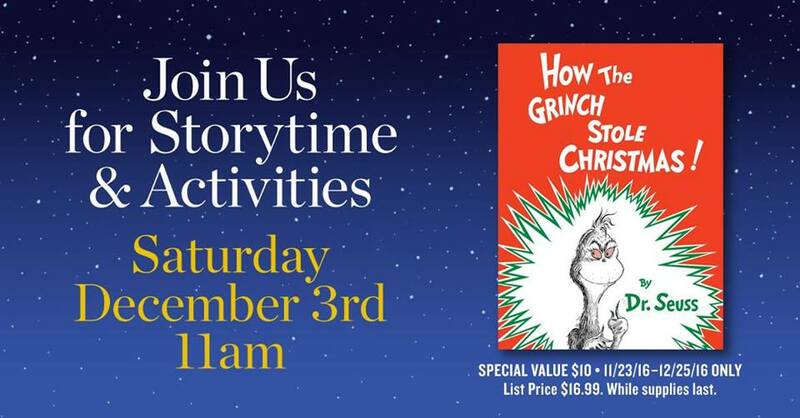 Come dressed in your favorite pajamas to enjoy the chilly wintery weather and snuggle-up for our storytelling session, and create winter arts and crafts! Parents are required to attend this event with children. Cost: Admission per child $10 early registration, $12 at the door. Parents are free! Pre-register online. Pictures with Santa, face painting, games and more! Join our hands-on workshop and you and your child can create a beautiful Gingerbread Candy Dish. 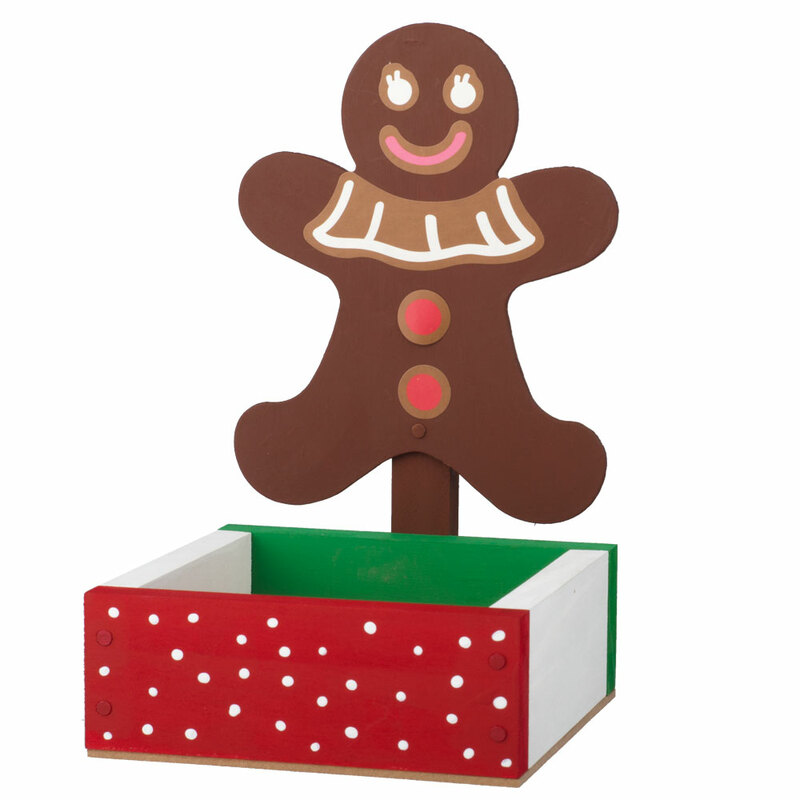 Once the candy holder is built, your child can decorate it with stickers to give their gingerbread mana cheery holiday smile. All kids get to keep their craft, receive a certificate of achievement, a Workshop Apron, and a commemorative pin while supplies last. Children must be present at the store to participate in the workshop and receive the kit, apron and pin. "Grow Your Heart 3 Sizes!" and celebrate all things Grinch with a reading of the classic How the Grinch Stole Christmas! We will have good deed badges and tracking booklets for kids to log all the good things they do this holiday season. Activities to follow. Frosting, candy canes, gumdrops, graham crackers…it’s time for our annual Gingerbread House-making event at the Art Museum! We’ll sing holiday songs and create an original gingerbread house that’s sure to delight one and all. For children ages K5-12. Cost: $15-members/$20-nonmembers (special price). Register online. Kids and kids at heart are sure to love this event! Construct an adorable gingerbread house and try to resist the temptation to snack on your building supplies. 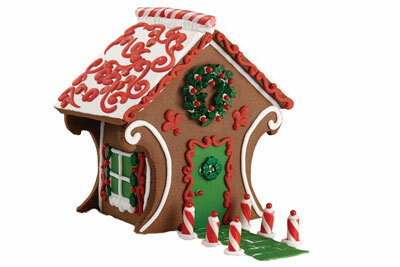 Cost: Buy a Wilton® gingerbread kit and use our classroom to assemble your creation. 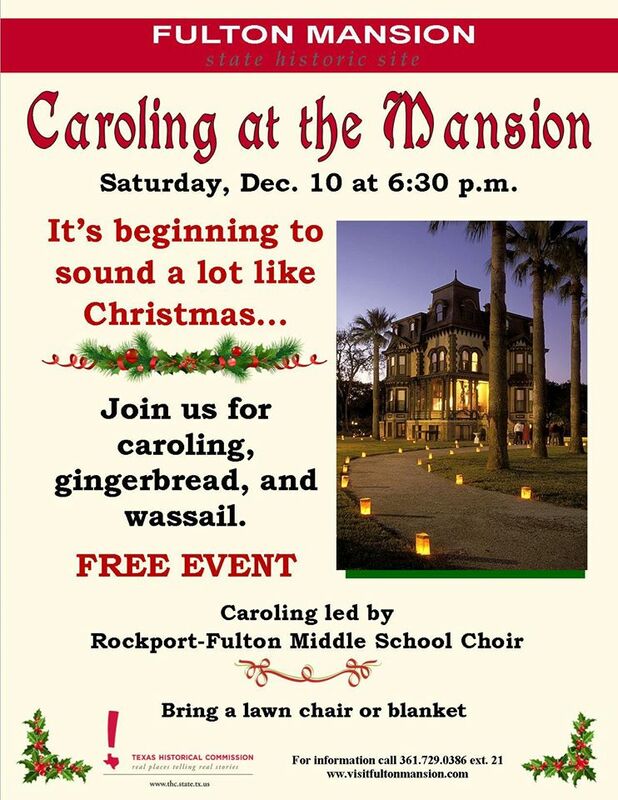 Seven historic venues can be toured by visitors in Rockport Fulton during the Rockport Fulton Tour of Historic Homes. Some of them have never been toured. Vintage dressed docents will share information about each home and its owners. Presented as a gift to the Coastal Bend by the members of First United Methodist Church and funded by a generous grant from the FUMC Foundation, Inc. This volunteer choir meets solely for the purpose of presenting this performance and is comprised of singers from across the Coastal Bend. 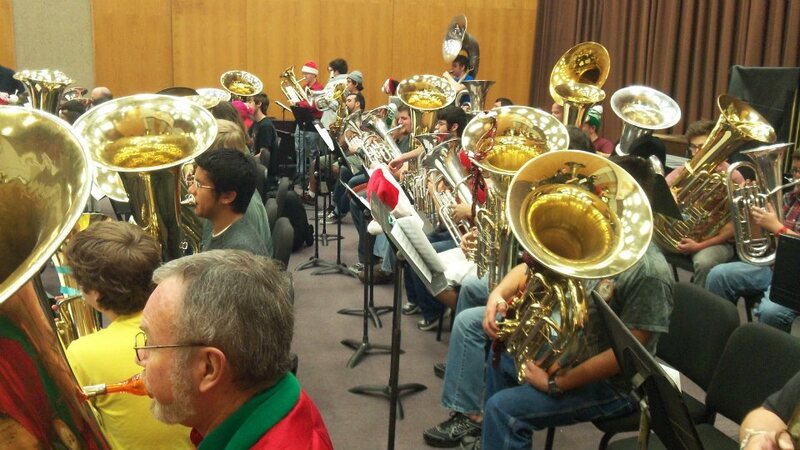 Come and listen to your favorite Christmas music as well as pieces from various genres. Come and enjoy all types of flute from piccolo to bass flute. A reception will follow. "In the not too distant future, Christmas has been all but forgotten. 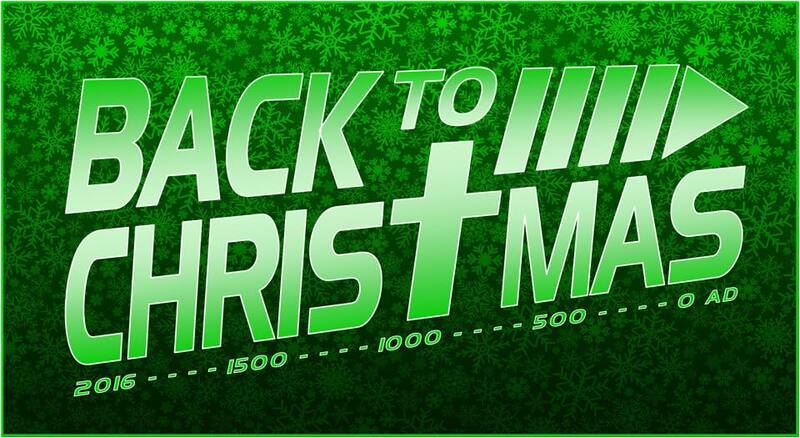 Join one family on an adventure through time as they discover the true meaning and power of Christmas!" Santa Claus is coming to…PORTLAND! Welcome Santa to town as he travels the illuminated parade route through the community. 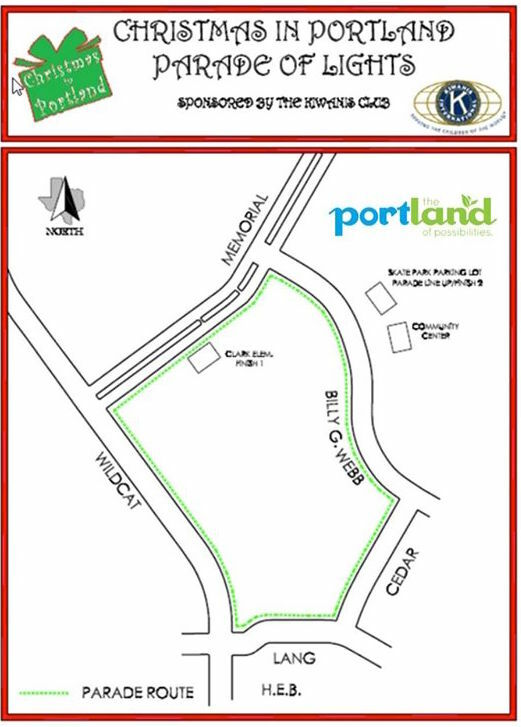 Individuals and companies who are interested in participating in the parade may complete a registration form available at the Portland Community Center. 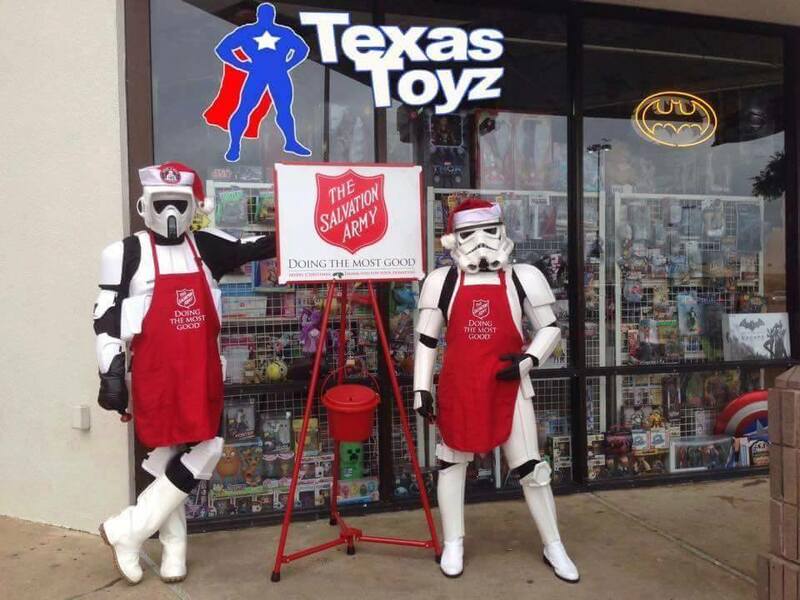 Don’t forget about our Toy Drive benefitting Christmas for Kids Year Round. 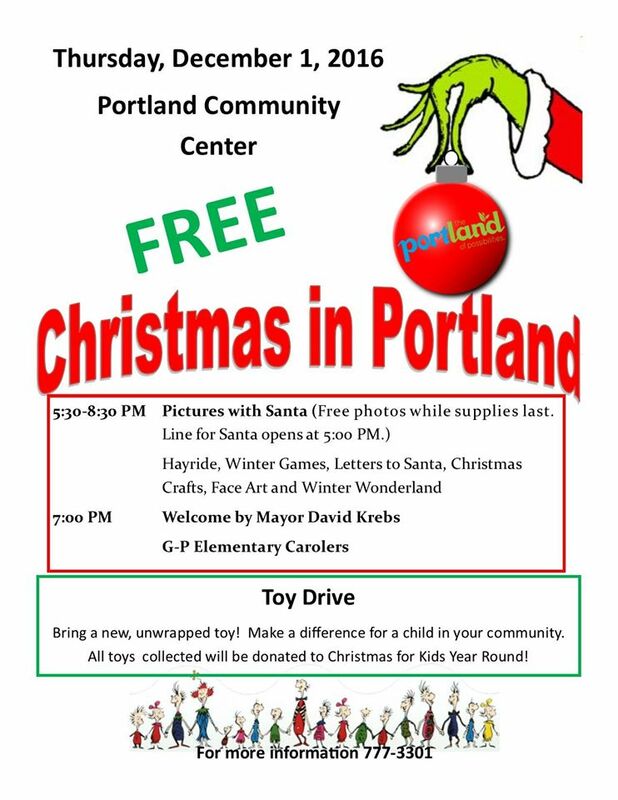 Drop off a new unwrapped toy at the Portland Community Center! 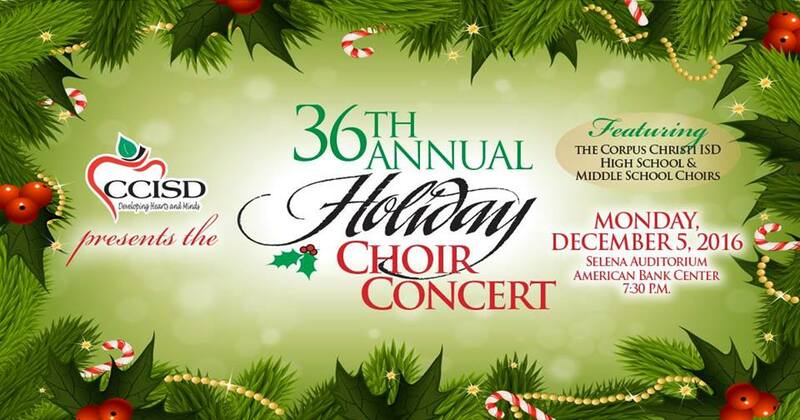 CCISD invites students, parents, teachers, administration and community members to attend the 36th Annual Holiday Choir Concert at the American Bank Center. Featuring over 750 students across CCISD high school and middle school choirs. Choirs participating include middle school girls’ treble choir, high school treble choir, young men’s choir and the high school mixed choir. 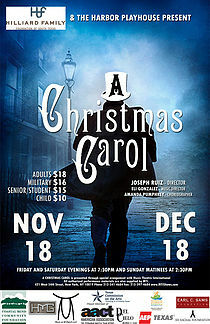 Enjoy holiday favorites ranging from the timeless Carol of the Bells to the antics of the infamous Mr. Grinch. Cost: Admission is free but American Bank Center charges $5 for parking. Cost: Reserved seating tickets range from $35 and $25 for adults and $7 for children and students with TAMU-CC ID. 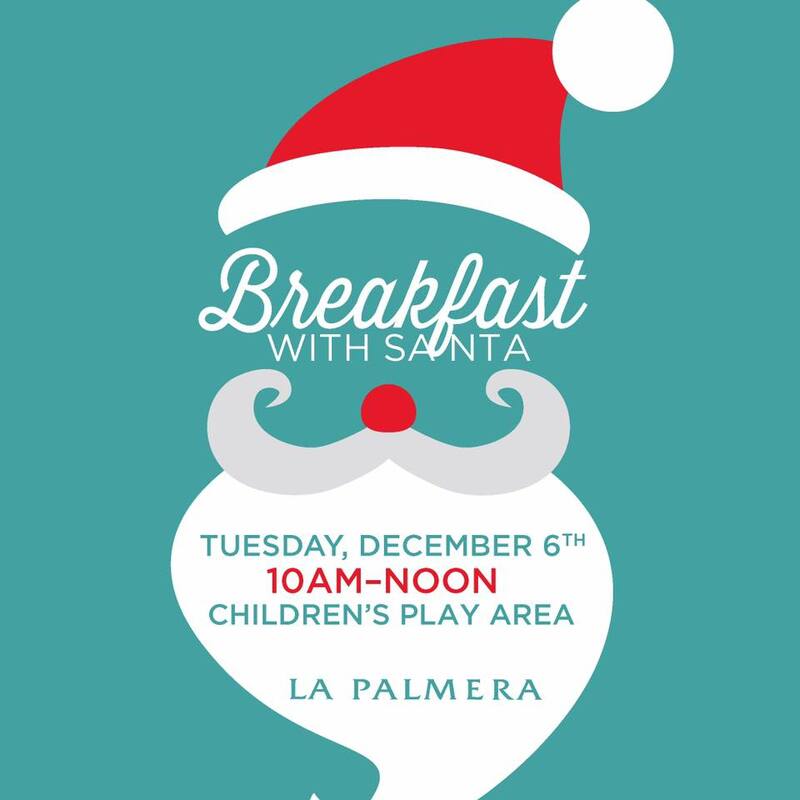 La Palmera will host a special “Breakfast with Santa”. In addition to enjoying refreshments and visiting with Santa, children will also get to work on holiday arts and crafts. Designed for kids 5 and under. 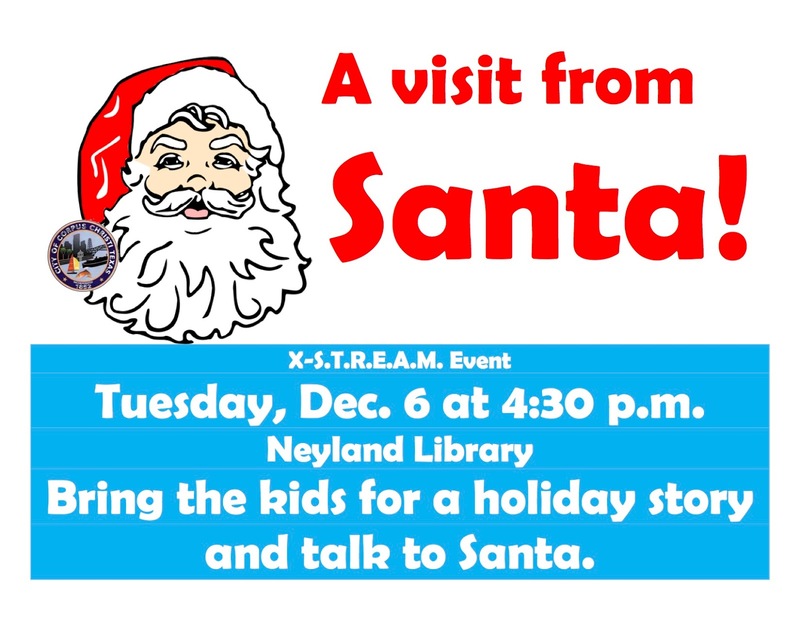 Santa Claus is coming to Neyland Library and he knows all the kids have been nice this year. 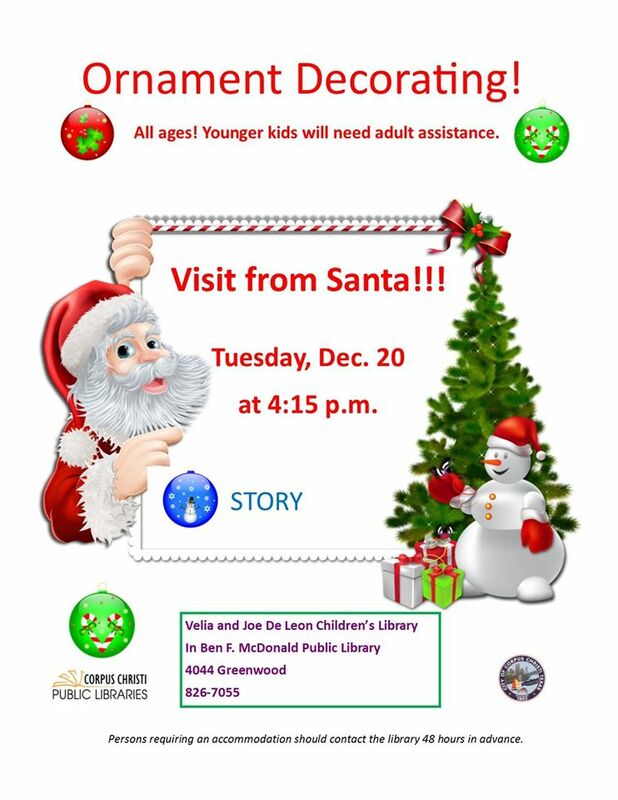 Kids can create a holiday craft, enjoy refreshments, holiday music and tell Santa what they want for Christmas. 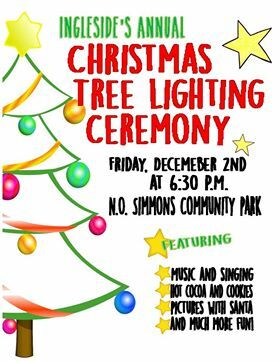 Bring the kids to the Ingleside Public Library’s Annual Children’s Christmas Tree Lighting! 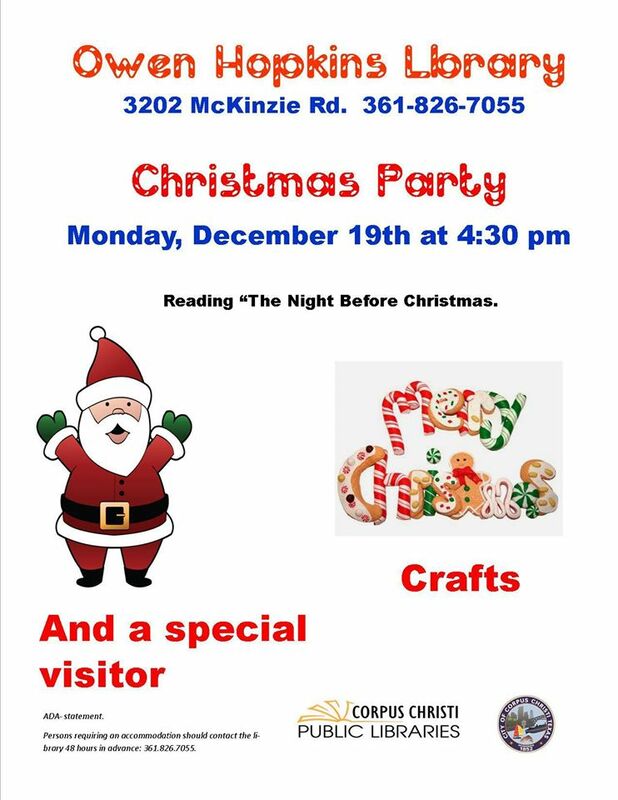 Come to the Ingleside Public Library to see Mr. and Mrs. Santa Claus and enjoy cocoa and cookies and lot’s of fun. 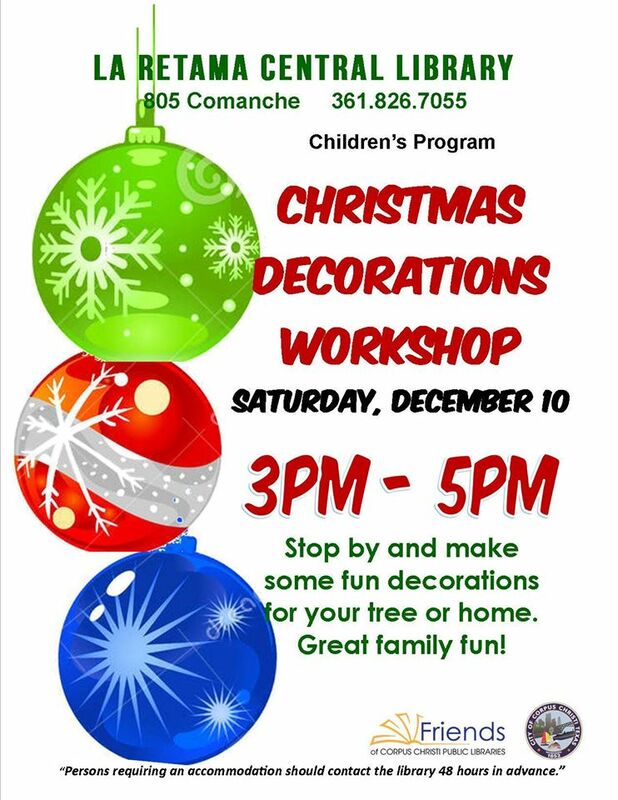 Join us for a little story telling, a little holiday music, a little paint, and a whole lot of fun! 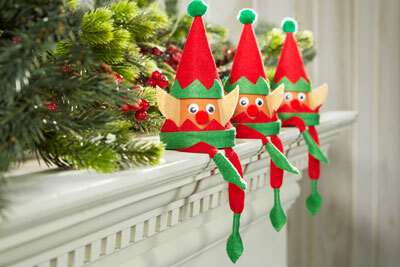 We'll create original holiday stockings with muslin, paint, glitter glue, and more. For ages 2 to 5. 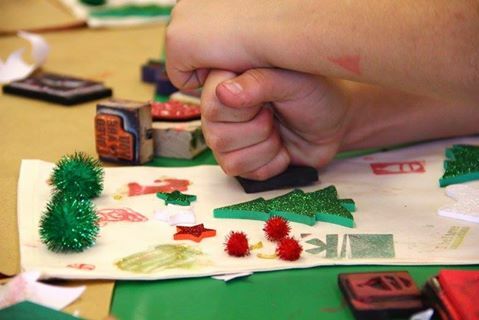 Holiday Ornaments We’re getting in the holiday spirit in this special session of Moms & Tots! Join us for an afternoon of delight as we sing Christmas carols, create an array of sparkling ornaments and take a special tour of the Christmas Tree Forest. For ages 2 to 5. 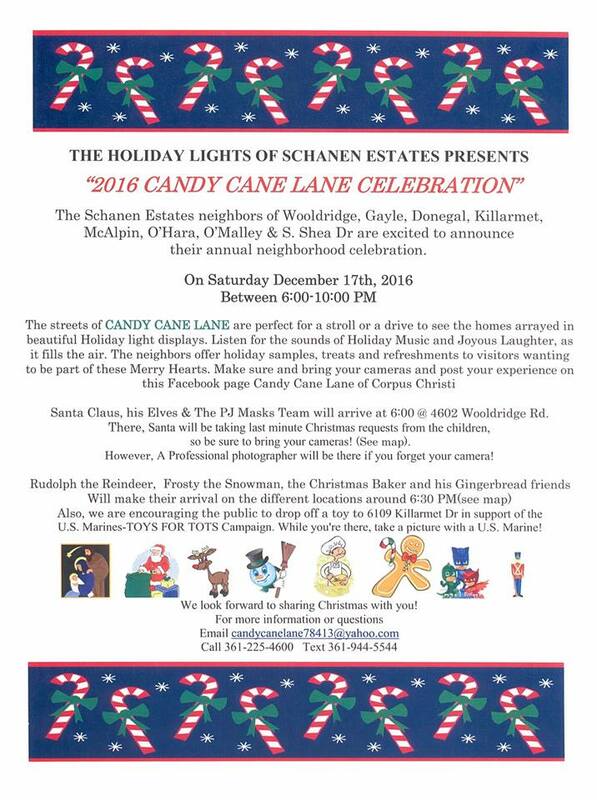 Come join in the Fun, Music, Meet and greet with Santa and enjoy some refreshments! 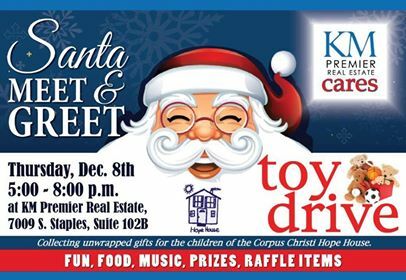 Collecting unwrapped gifts for the children of Corpus Christi Hope House. 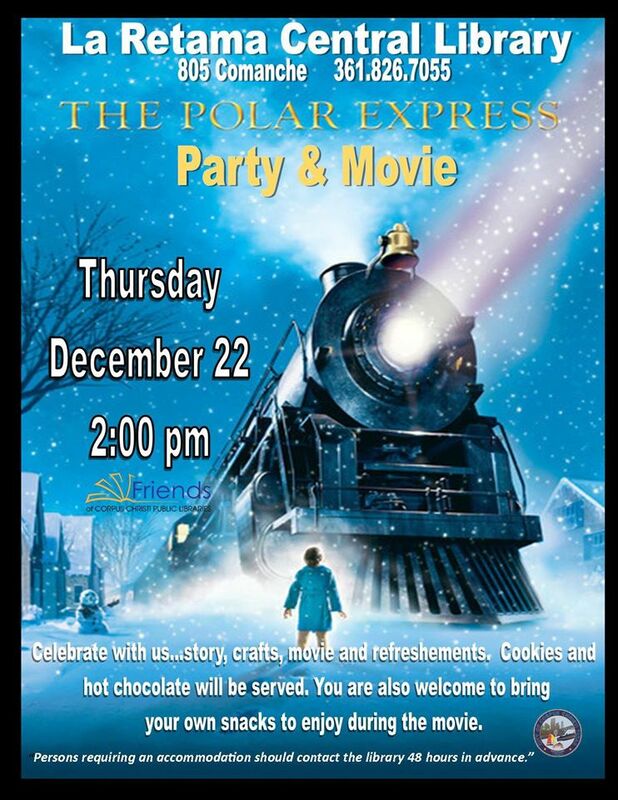 Snow play, visits with Santa, refreshments, Holiday sing along, and more! 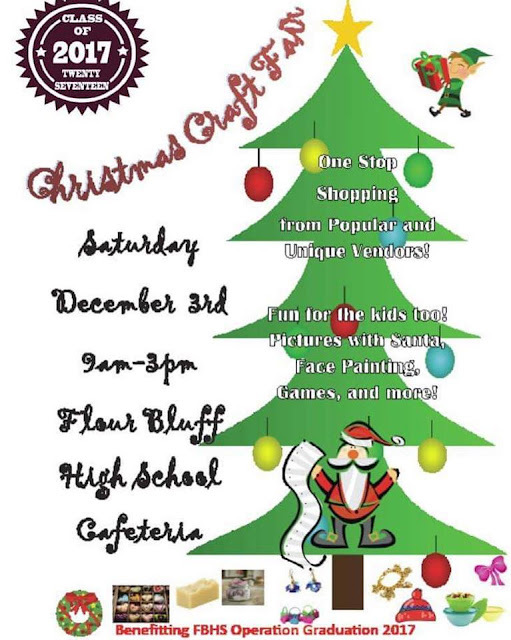 Join the Flour Bluff Business Association in welcoming Santa and his elves. 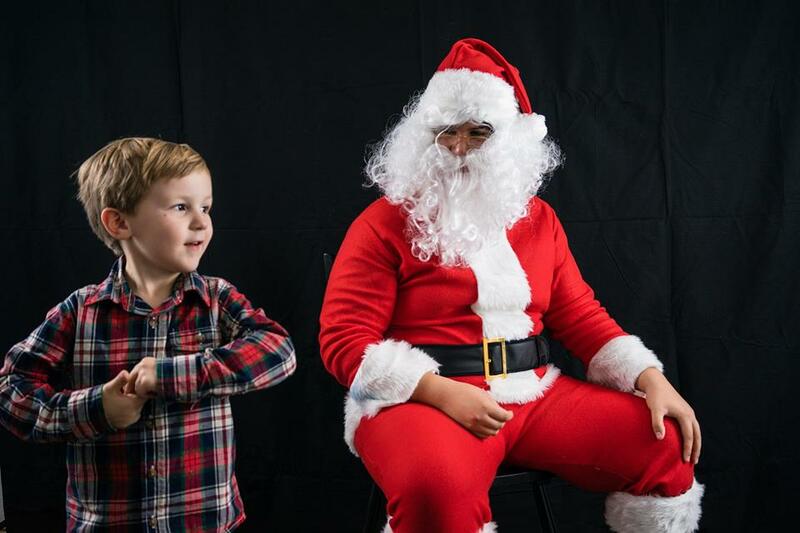 Every kid will get a chance to meet Santa for a picture and gift. We will have entertainment throughout the evening including a Cake Walk and much more! 9605 S Padre Island Dr. This laugh-out-loud movie is about the Grinch who can’t stand the holiday cheer from the Whos of Whooville. So, along with his companion, Max, he steals the gifts from under the Christmas trees of every Who. As the Whos rejoice anyway, he realizes that Christmas is more than just gifts and Roast Beast. Bring your lawn chairs or blankets. For more information, call 361-826-PLAY. A large Lighted Boat Parade on the North canal route on the island. Usually 40 to 50 boats collecting toys for the children of the city of Corpus Christi and Nueces County. 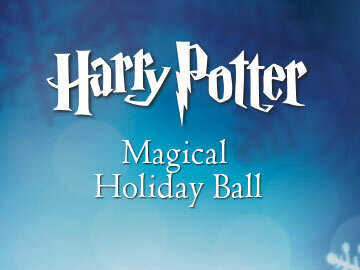 Dress like your favorite Harry Potter character, wear your holiday best or come as you are and join us for dancing, music, activities and giveaways. Cost: Free 5129 Blanche D Moore Dr.
Join us for a memorable morning filled with a holiday themed craft, photos with Santa and hot cocoa bar. Santa Cow can’t wait to see you there! 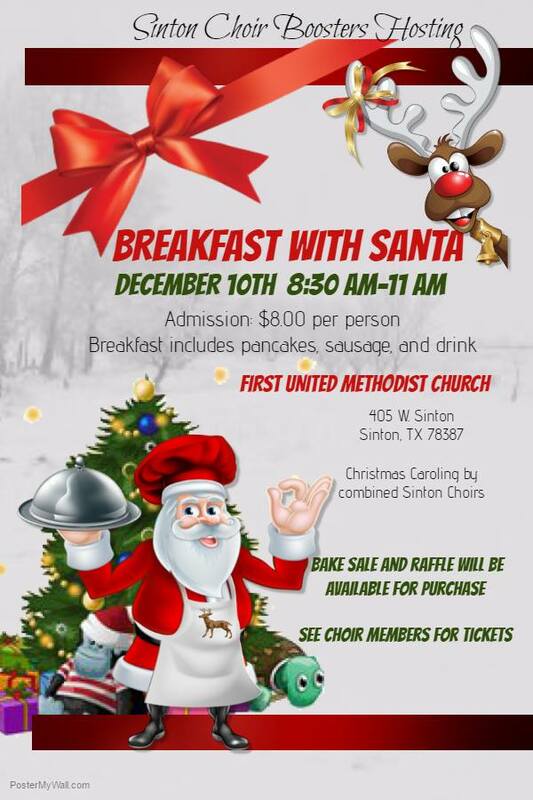 The Sinton Choir Boosters wil be hosting Breakfast with Santa. 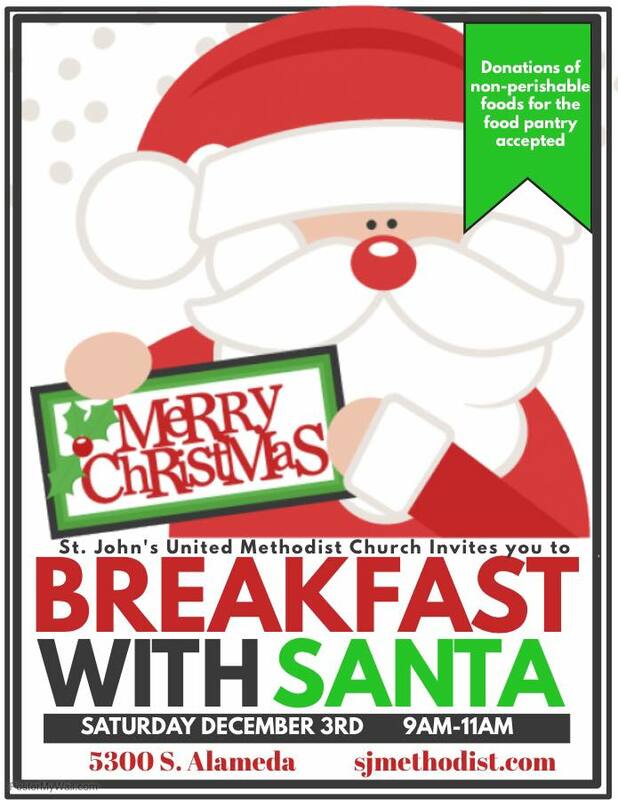 Bring your family to have breakfast with Santa and listen to the Choir sing. Breakfast includes pancake, sausage, and drink. Pancakes, games, bingo,crafts and storytelling, and an opportunity to snap a photo with Santa. Cost: Free but please bring canned goods to donate to the Food Bank of Corpus Christi! Christmas is a time of tradition, and our annual holiday family day is one you won’t want to miss! 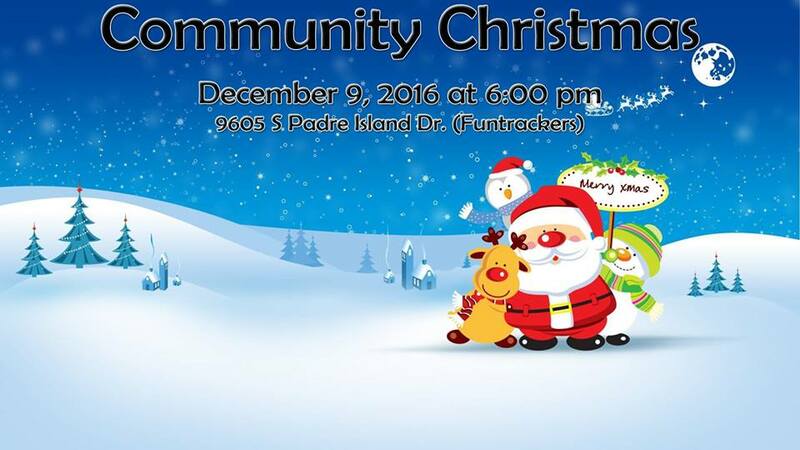 Join us and our partners, H-E-B and the Junior League of Corpus Christi as we celebrate the season with A Reading Wonderland Christmas Tree Forest. 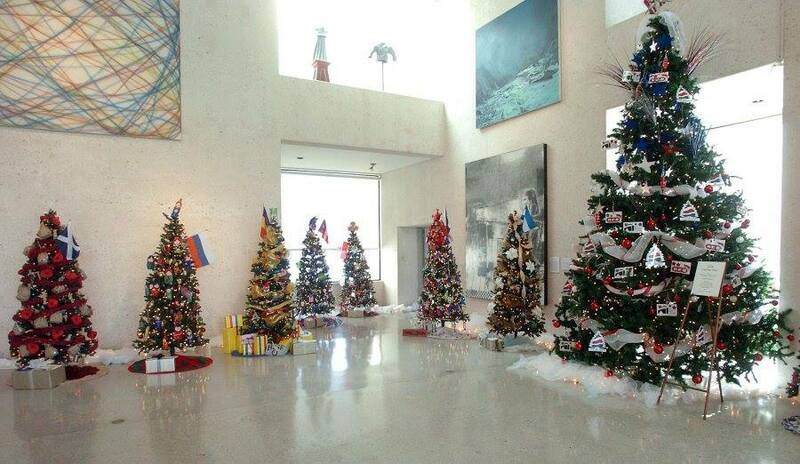 With holiday music, H-E-Buddy goodie bags, book giveaways and self-guided tours of the tree forest, there will be something for every member of the family to enjoy. Santa will even be taking some time from his busy schedule to visit so bring your cameras to snap a photo! This is definitely an event you won’t want to miss! For all ages. Come out to Live Oak Park and take a step back in time. Be entertained by Jousting Knights, Pyrojugglers, Belly Dancers, Great Music, Food, Arts & Crafts and much more! Activities, food, and fun for the entire family! In appreciation to our clients and the community, we will be offering hams in exchange for one unwrapped gift that will be donated to Toys for Tots. The Annual Harbor Lights Festival rings in the beginning of the Christmas holiday season by transforming the beautiful Bayfront Marina into a Fiesta Holiday. 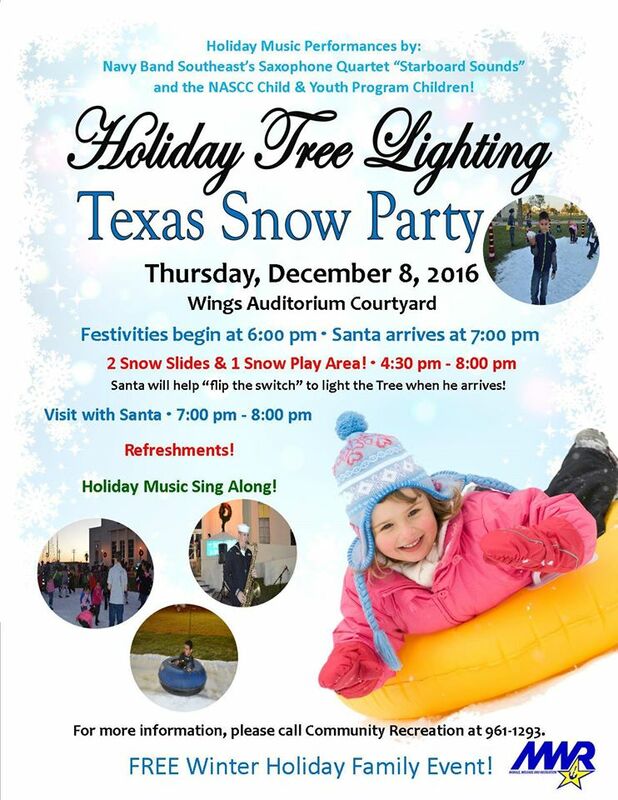 This fun filled event has grown into a South Texas tradition and is a “must attend” family event. AEP Texas Children’s parade, Children’s Activity Area, Children’s Fun Zone, live entertainment, food and gift vendors and enjoyable family activities throughout the evening. 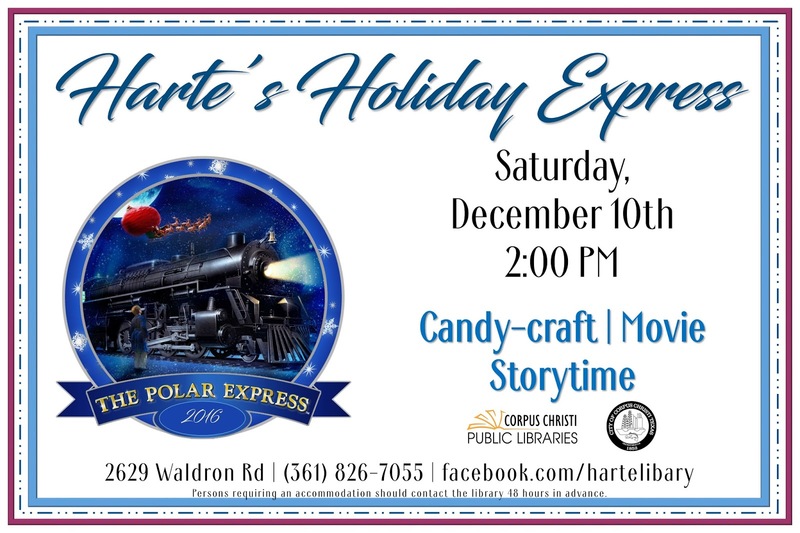 Polar Express movie, craft, and storytime. 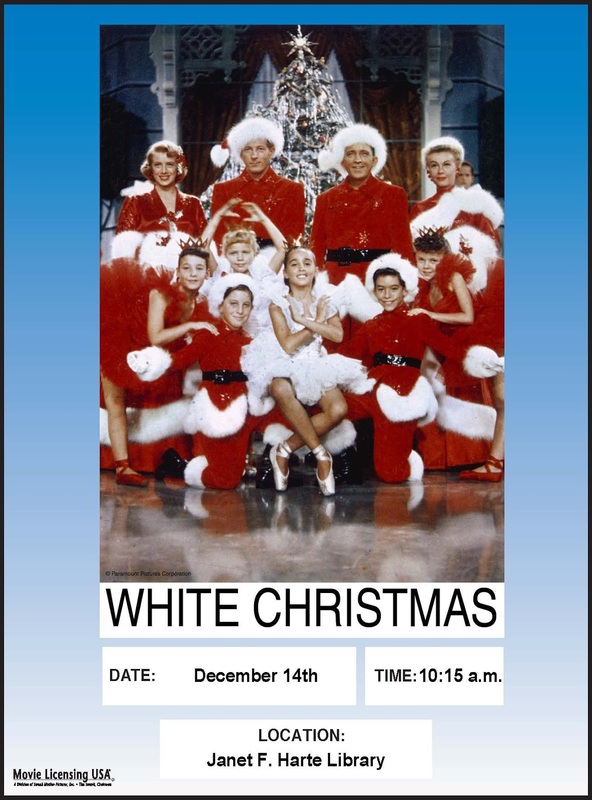 A classic holiday favorite featuring a marvelous cast of over 100 with lavish scenery, dazzling costumes, and exciting characters. Family Weekend with tickets half off regular price and no live orchestra. A large Lighted Boat Parade on the South canal route on the island. Usually 40 to 50 boats collecting toys for the children of the city of Corpus Christi and Nueces County. Moms, Dads, Grandmas and Grandpas will want to make sure they bring their little Elsas, Olafs and Annas in costume to help Guest Maestro, Paul Haas, make sure everyone has a Fabulously Frozen Fun time! 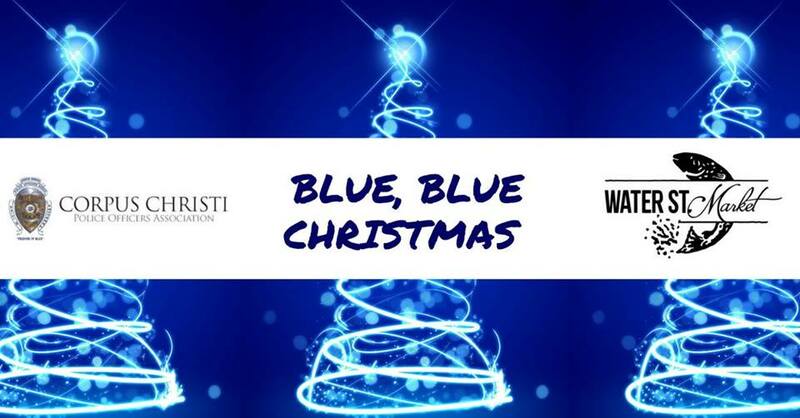 Maestro Haas will begin this much anticipated holiday concert with traditional holiday favorites including Sleigh Ride and selections from the Nutcracker. Then, audience members are in for a real treat when the Del Mar Master Chorus and the Corpus Christi Chorale sing the Hallelujah Chorus. Also, expect a few surprises that will be sure to delight the senses and maybe even bring a (joyful) tear to the eye! Of course, the ever popular sing- a- long and visit from Santa will cap off a very memorable evening you will not want to miss! Cost: Tickets range from $21-95. Buy online or call 361-883-6683. 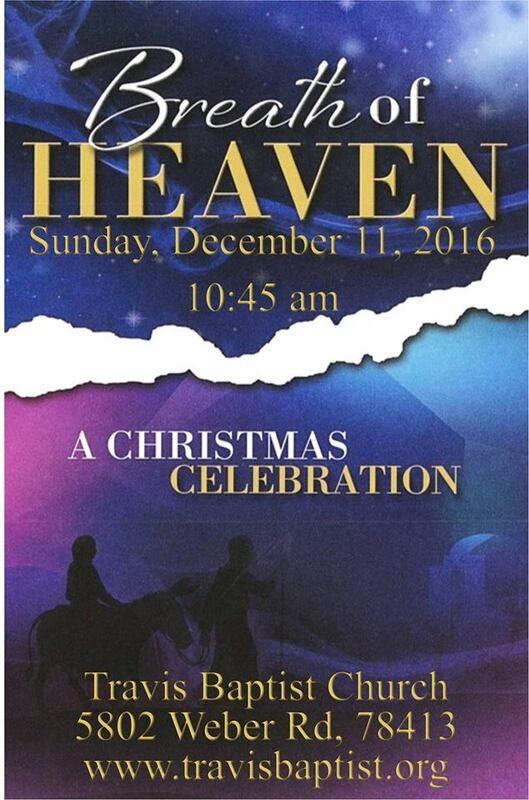 Celebrate the birth of our Savior with this special presentation from the Travis Baptist Church choir. 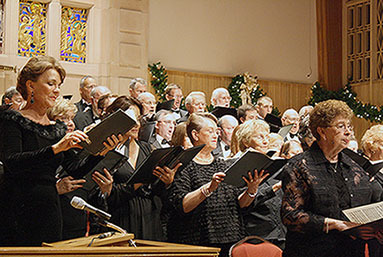 Join us in worship for a morning of festive music presented by the Parkway choir. "In the not too distant future, Christmas has been all but forgotten. Join one family on an adventure through time as they discover the true meaning and power of Christmas!" Christmas Festival from 4-7 pm. Inflatables, food trucks, face painting, rockwall climbing, gaming and diva trailers, pony rides, hay rides, s'mores bonfire, and more. This is a free event for the whole community, though we will have food trucks on hand if you'd like to purchase snacks, food, and drinks. 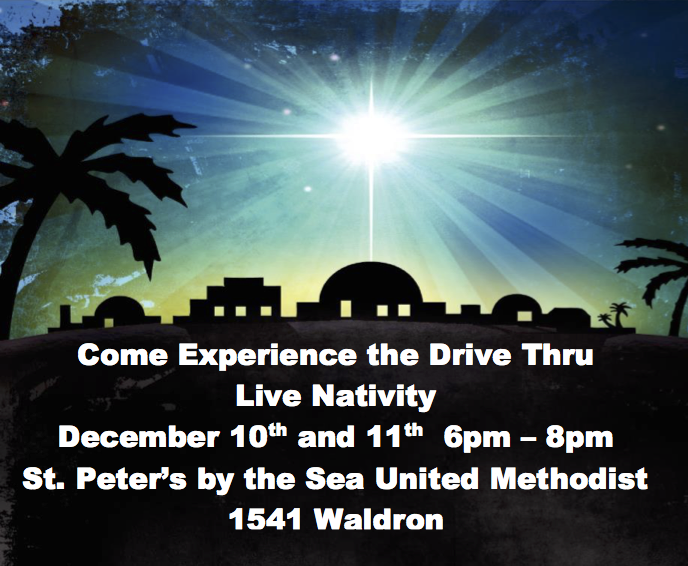 Then come inside from 7-8 pm and join us for a showing of our free Christmas Play. 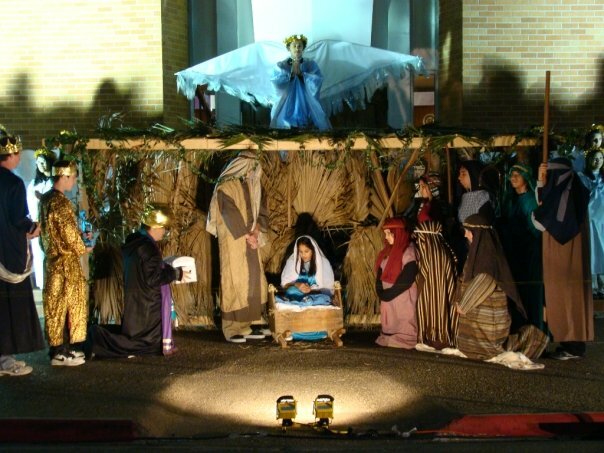 Come hear the story of Christmas as told by the children of Parkway AND hear our congregation offer their gifts in music and song with the Sounds of Christmas. Come join Eleanor's for some hot chocolate and pics with Santa! We will have a photographer on hand to snap a few pictures and sent to you via email within a few days or you can opt to have it printed and picked up at Eleanor's the following week. From glittery snowflake clings to “stained glass” window ornaments, create special handmade decorations to celebrate the season! For ages 2 to 5. 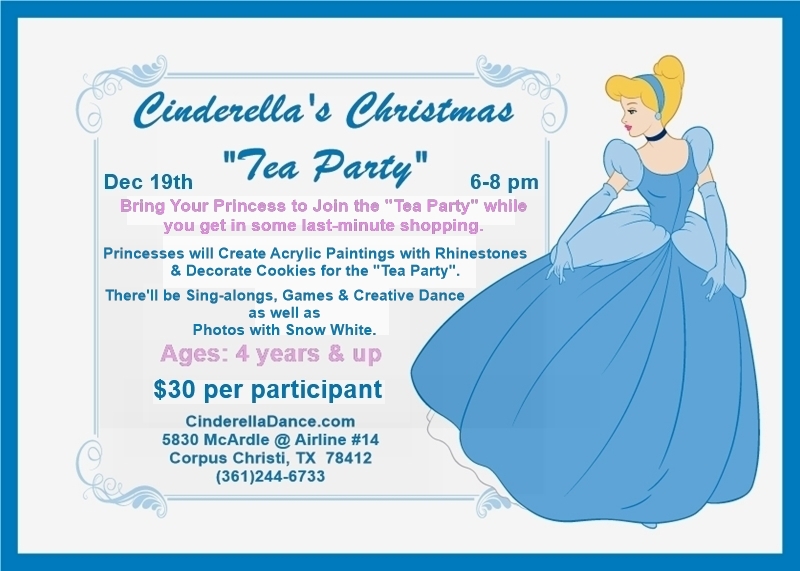 Cost: $10 members / $15 nonmembers. Register online. Join us as we sing Christmas carols, read our favorite holiday stories, and create the sweetest treat imaginable. Using lots of frosting, graham crackers and all kinds of Christmas candies, you’ll create an original miniature Gingerbread House that will be sure to brighten up your holiday! For ages 2 to 5. Cost: $15 members / $20 nonmembers. Register online. 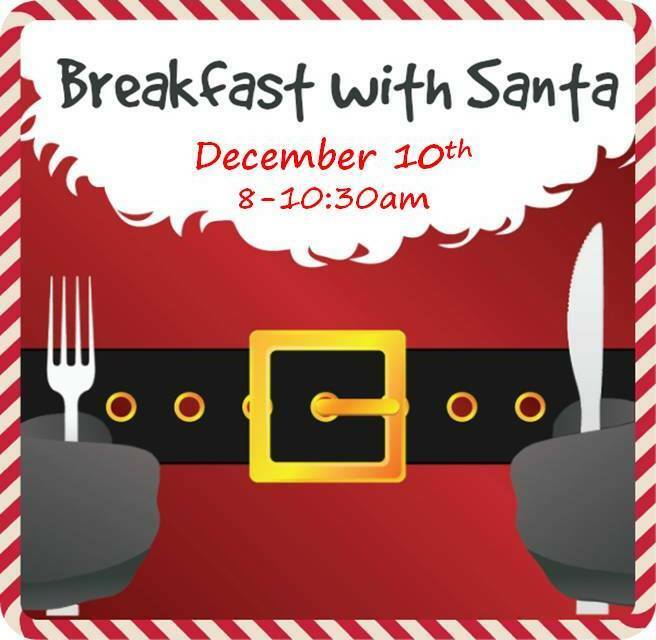 Come have Breakfast with Santa at the Ingleside Fire Station which includes pancakes, eggs, bacon, and beverages. Pictures with Santa will be available. Donations go to support the Ingleside Volunteer Fire Department. 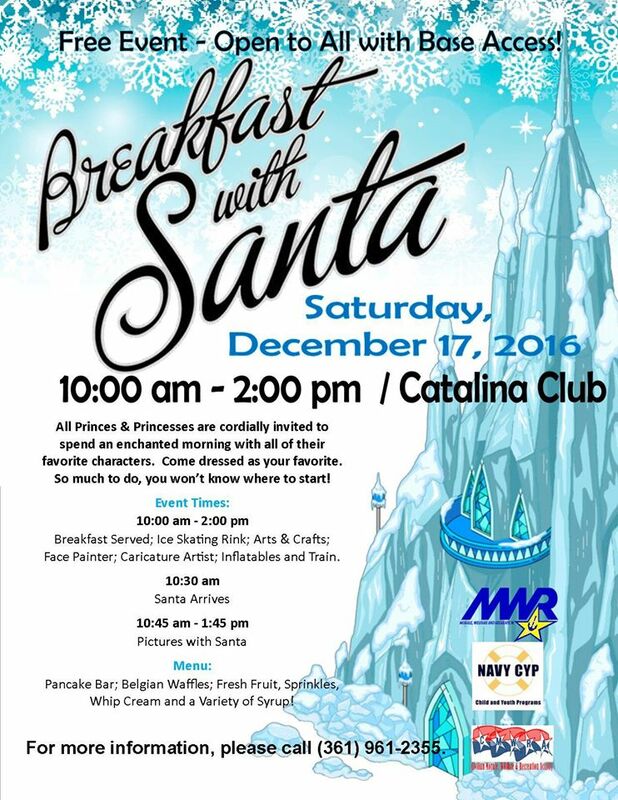 A special breakfast and pictures with Santa with activities that will include ice skating, arts and crafts, train ride, and face painting. The menu will include pancakes, waffles, fruit, and syrup. Families with children with base access are invited to this event! For more information, please call 961-2355. 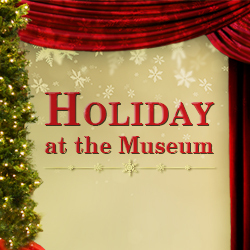 Celebrate at the museum with holiday themed science and history! 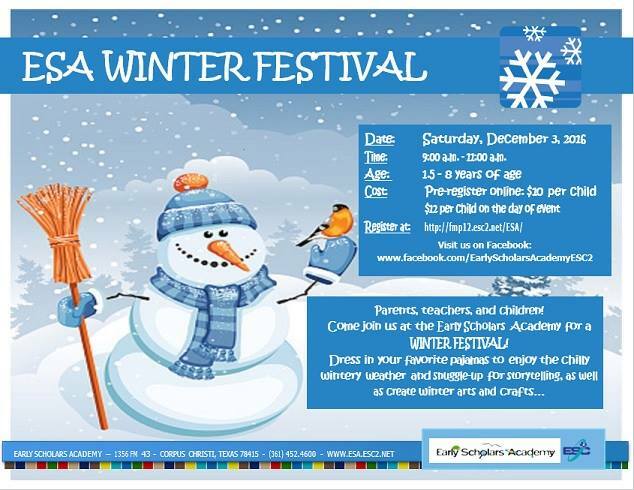 Take your photo with Santa, Winter activities, Holiday Experiments. Cost: $7 for members, General Admission Adults: $9 Senior Citizens: $7 Military (w/ active I.D. ): $4.50 Children (ages 3-12): $7 Children (ages 2 & under): Free. Register online or call to register 361-826-4667. Scholarships are available. It's a magical Christmas Eve, and all of the children in your town are sleeping. Well, all of the children but you! How could you possibly fall asleep when you know Santa and his sleigh are on their way? 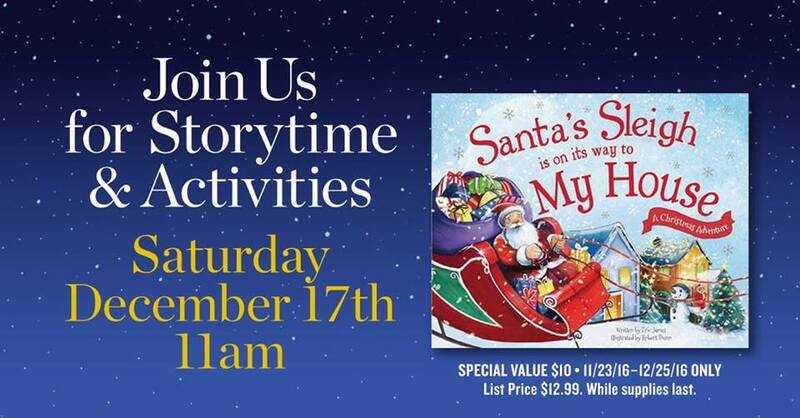 Join us for Storytime and activities featuring Santa's Sleigh Is on Its Way! Huge craft sale and food and goodies for the entire family. 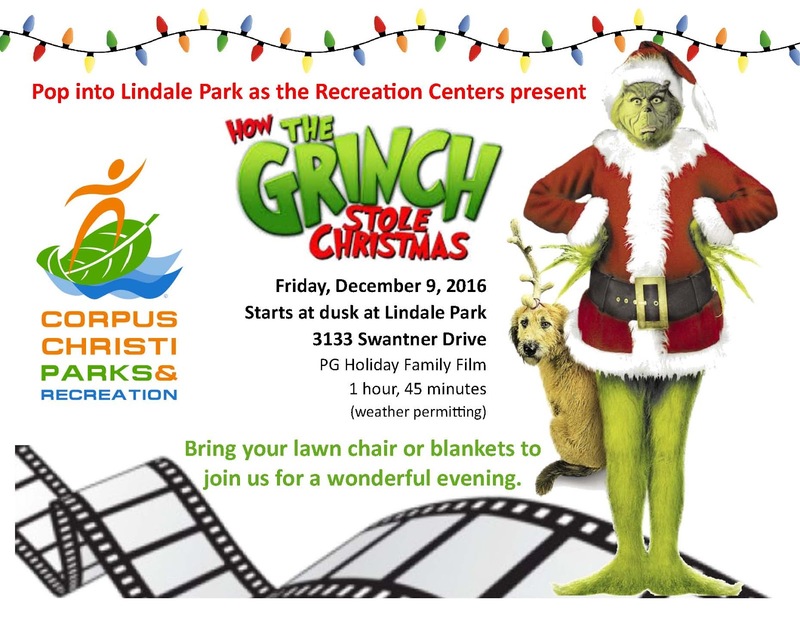 Movie, popcorn, pizza and crafts will be provided for their entertainment. Cost: $10 a child with a max of $30 per family if more than 3 children are dropped off. Registration is due by December 15th. Contact Matt and Kelly for more info. 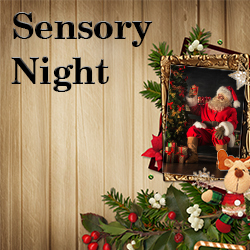 Come celebrate the Holidays at the Museum’s Sensory Night! Children with sensory sensitivities are invited to enjoy a calm evening with interactive and fun activities. Take your picture with Santa and enjoy holiday activities such ornament making, finger-painting, letters to Santa and more! Cost: FREE for members, General Admission Adults: $9 Senior Citizens: $7 Military (w/ active I.D. ): $4.50 Children (ages 3-12): $7 Children (ages 2 & under): Free. Dinner is available for purchase. $10 per person. Dinner will be pasta and salad. Register online or call to register 361-826-4667. Scholarships are available. Santa and his elves along with PJ Masks team will at at 6 pm to 4602 Wooldridge Rd. There will be much to see and to. See map for details. 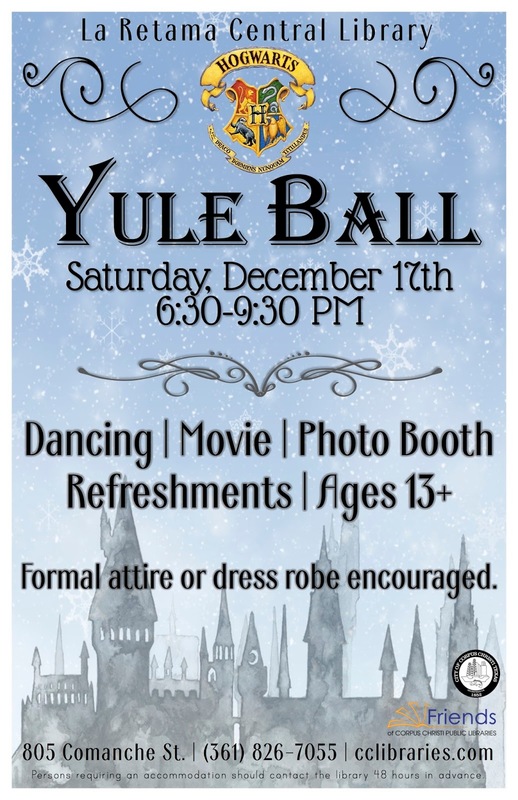 Dancing, movie, photo booth, formal attire or dress robe encouraged. The event is for ages 13+. 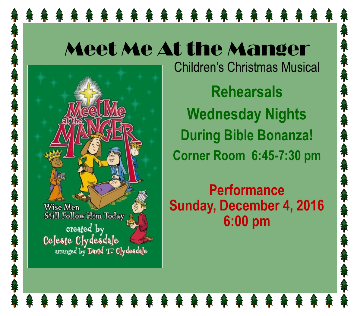 A classic holiday favorite featuring a marvelous cast of over 100 with lavish scenery, dazzling costumes, and exciting characters. Gala performances with a live orchestra.